What is a Mile or Point Worth? Advertiser Disclosure: MilesTalk has partnered with CardRatings for our coverage of credit card products. MilesTalk and CardRatings may receive a commission from card issuers. This site does not include all financial companies or all available financial offers. Did you miss a deal? Never again! Apply to join the members-only MilesTalk Facebook group. Find your personalized best credit card at YourBestCreditCards.com, powered by MilesTalk. We analyze your spending and calculate exactly how much you'd earn in rewards on over 70 credit cards. I’ve been targeted twice previously by United for a MilePlay promo and just got a new one. 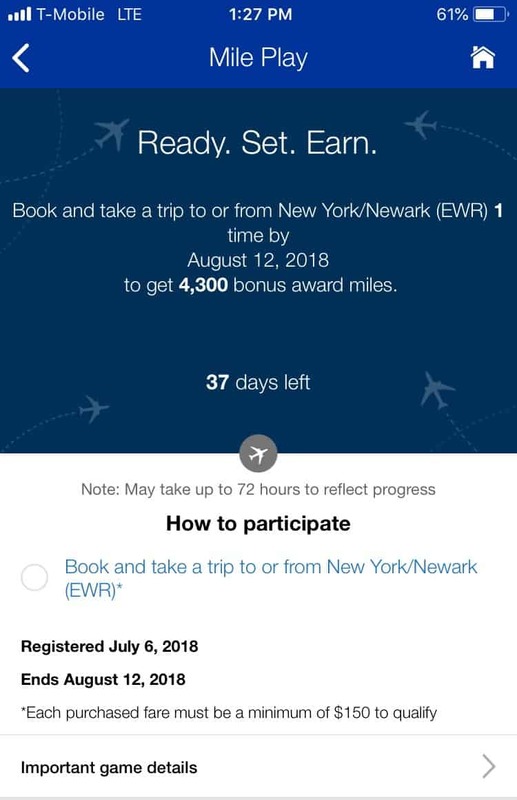 In short, MilePlay is how United tries to incentivize you to do one or more activities – generally including some flying – for bonus miles. All you need to do is go to the United app or website, find the MilePlay offer, and click to accept. Will this offer drive to to United? Not really. But if I have a short / cheap flight I need to take and it’s served well from UA at Newark, well, I might. I’m sure some of you have better offers. What did you get? Let me know here, on Twitter, or in the private MilesTalk Facebook group. New to all of this? My new “introduction to miles and points” book, MilesTalk: Live Your Wildest Travel Dreams Using Miles and Points is available now. I got "in the game" in 2003 and since then I've collected literally millions and millions of frequent flyer miles and hotel points. I've flown around the world in first class seats that would cost $29,000 using frequent flyer miles and a few bucks in tax. And I've stayed in some of the finest hotels - all for free! A few years ago I realized many of my friends actually thought I was paying for these!! So I started sharing my tips. It's long been a passion, but when I hosted a session on Miles and Points at this year's South by Southwest festival, my love of the game intensified and this blog was born. Free TechDay Badges: Come Visit Me at TechDay in NYC! Decoding AA's Dynamic Pricing: What Will a Mile Be Worth? Advertiser Disclosure: MilesTalk has partnered with CardRatings for our coverage of credit card products. MilesTalk and CardRatings may receive a commission from card issuers. This site does not include all financial companies or all available financial offers. Editorial Note - Opinions expressed here are author's alone, not those of any bank, credit card issuer, hotel, airline, or other entity. This content has not been reviewed, approved or otherwise endorsed by any of the entities included within the post. Responses to comments are not provided or commissioned by the bank advertiser. Responses have not been reviewed, approved or otherwise endorsed by the bank advertiser. It is not the bank advertiser's responsibility to ensure all posts and/or questions are answered.